A massive volcanic eruption occurring in a remote corner of Iceland has grounded and diverted planes. 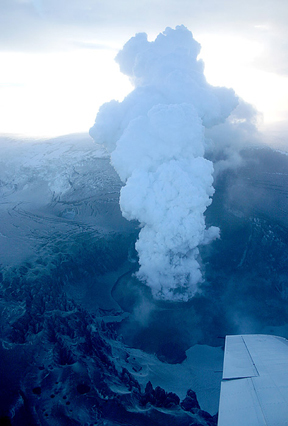 The Grimsvotn volcano, shown here erupting today in a remote corner of Iceland, began its activity on Monday. Image is copyright by Frederick Holm and courtesy of Nordvulk (the Nordic Volcanological Center). The Grimsvotn volcano started to explosively erupt on Nov. 1, three hours after a swarm of earthquakes indicated the onset of an event. Magma had been accumulating in the volcano since its last eruption in 1998, according to the Nordic Volcanological Center. The volcano sits beneath the middle of the Vatnajokull ice cap. The volcano's caldera lake, warmed from geothermal activity, burst through the glacier sitting above it in the cone. The sudden flood was the final straw for the volcano: Suddenly depressurized as the weight of the water was removed, the volcano erupted, according to researchers from the Icelandic Meteorological Office and the University of Iceland in Reykjavik, Iceland.